Simply the most enjoyable cycle route of any on the Mediterranean coast, made all the better by electric bikes. 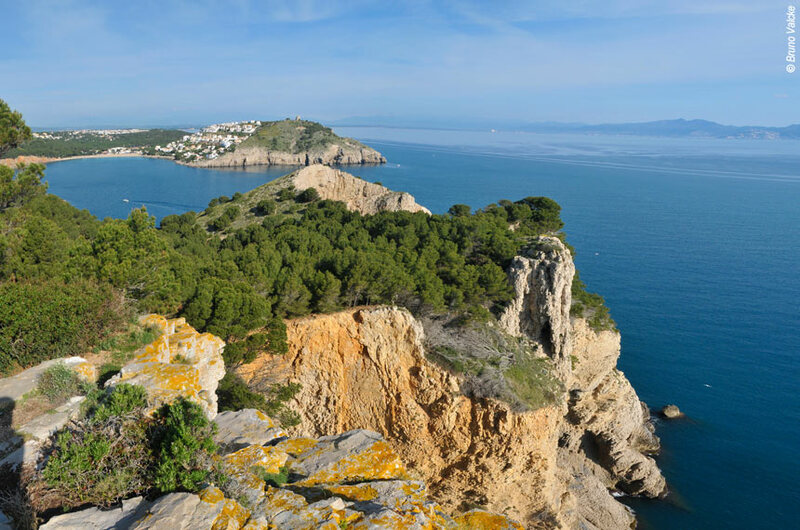 Easy cycling, quiet sandy bays, typical fishing villages, wooded hills, vineyards, interesting accommodation, good food, and the haunts of artists like Picasso and Dali. The Mediterranean without frontiers - and a landscape made for enjoyable cycling by electric bike that enables you to visit a wealth of historic, beautiful and vibrant villages with castles, harbours, lighthouses and vineyards galore. Although it is generally low altitude, there are sections with extraordinary panoramas. There are also tiny coves with sandy beaches surrounded by pine trees. No wonder this is also a region much favoured by artists. 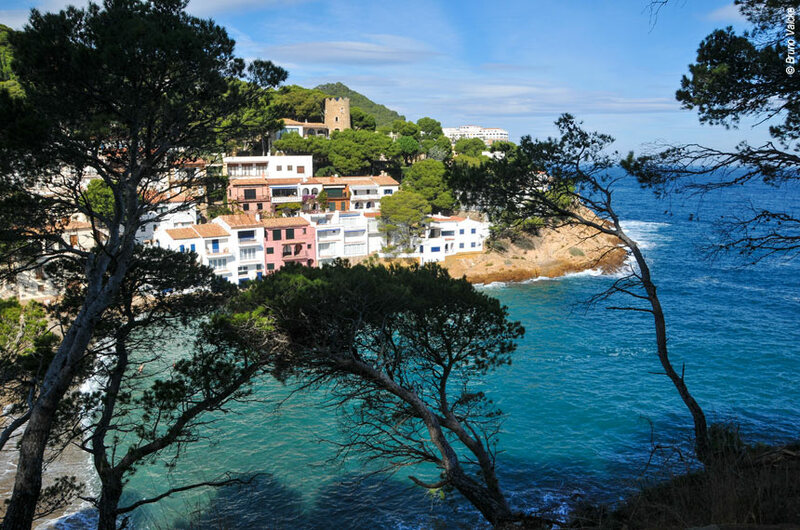 This is the authentic Costa Brava that is true to its name - the wild coast - with the mass-market resorts far to the south. With extra airport pick-up: We pick you up from Perpignan airport or railway station and take you to Collioure. Pick-ups also available from Toulouse, Carcassone, Montpellier, Girona or Barcelona (please consult us for prices). Collioure is an old fishing village with its castle's foundations lapped by the Mediterranean itself, but now more famous for having inspired artists like Matisse and Picasso. Depending on your arrival time, you can choose to walk around the town, and/or take your electric bike for a short trip up to the Col de Mollo, with magnificent views along the coast. You stay at the excellent 3 star Hôtel Les Princes de Catalogne well located in the heart of the village just a few metres from the sea, and dine at a nearby favourite restaurant offering a range of interesting local dishes with contemporary twists. Alternatively, if you want to push the boat out, you can stay at the superb 4 star Relais des Trois Mas right on the water's edge across the bay from the castle with its Michelin starred restaurant. Transfer time : 40 minutes. Distance: 16km. Having been briefed about your electric bike (very simple! ), the joys of cycling become immediately apparent as you happily whisk from village to port along this magnificent stretch of the Mediterranean coast with the distant 8,500 feet high Mount Canigou up to your right (snow often through into June). You will enjoy visiting the pretty little port of Port-Vendres, then Banyuls-sur-Mer, famous for its delicious aperitif and surrounded not surprisingly by vineyards, before climbing a little up onto a coastal "balcony" that takes you to Cerbere with lots of wonderful panoramas. You cross the border into Spain via the Coll dels Balistres, and then the views of the coves and creeks before you as you descend into Port Bou. The final section to Llanca offers more panoramic views, and at least 2 exceptional beaches - plenty of time for sunbathing and swimming! Today, you leave the port of Llanca (having walked around it the previous evening, we expect) and "coast" along passing beautiful beaches to the picturesque little port and marina of La Selva, protected by its horseshoe shaped bay. 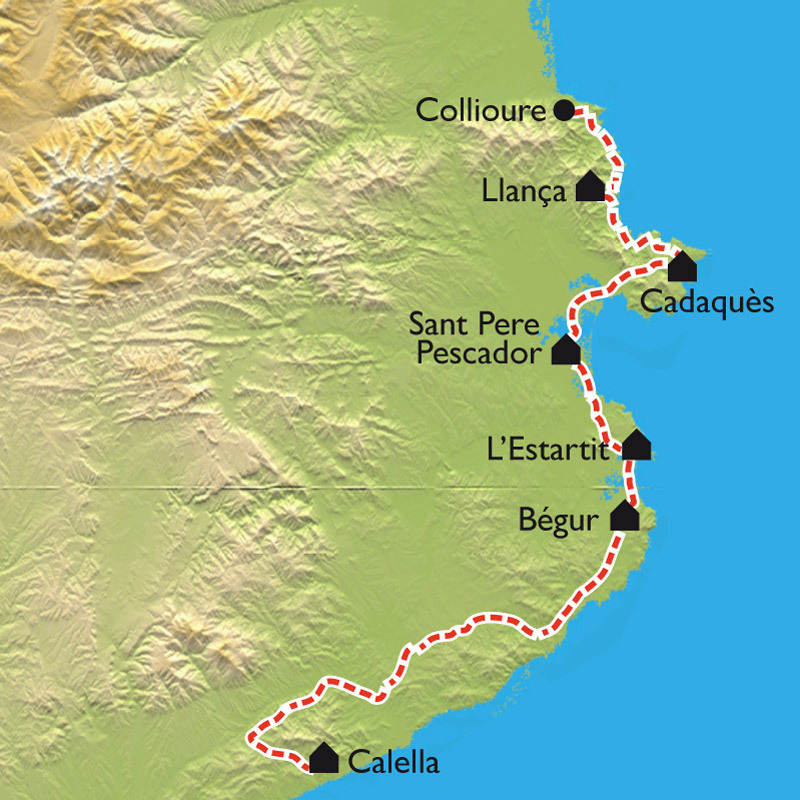 You can then choose to ride more or less directly through some lovely countryside to Cadaques, or, as we would recommend, ride out to the magnificently wild and unspoilt Cape Creus, with its lighthouse dominating the horizon, before following the "crumpled" coastline on a beautiful road into Cadaques. Salvador Dali lived in Cadaques for many years, and you can visit his wonderfully quirky house right by the sea on the outskirts of the village. Highly recommended, but needs advance booking - we will tell you how. Cadaques is many people's favourite along this coastline, and you stay at the excellent 4 star Hôtel Playa Sol, a modern hotel right on the waterside, but with extensive private gardens with tennis court, swimming pool and plenty of places to quietly relax after your journey. You dine a short stroll away at one of our two favourite restaurants here. It may be a bit of a shock to the system when you have to start the day with a climb up onto the hills above Cadaques, but you are rewarded with lovely views as you descend into Roses (a town with much history since founded by Greeks in the 5th century BC), adn renowned for the Castell de la Trinitat, phylloxera which destroyed its wine industry in the late 19th century, and, until recently, the best restaurant in the world, El Bulli. Drop into the fascinating man-made marina village on its outskirts - and similarly as you pass Empuriabrava - but you mainly follow a small, quiet (and fairly flat) road into the historic riverside village of Sant Pere Pescador, just a kilometre or two from a rather impressive 7 km sandy beach. The 2 star Hôtel El Moli is a charming and stylish family run hotel with individually decorated rooms and a lovely swimming pool, all set among pine trees that together makes for a most relaxing place to stay. We leave you free to choose your own restaurant for tonight, but have recommendations if you would like them. This is without doubt the most panoramic day of your journey. You follow lanes and cycling paths close to long beaches all the way to Sant Marti d'Empuries. 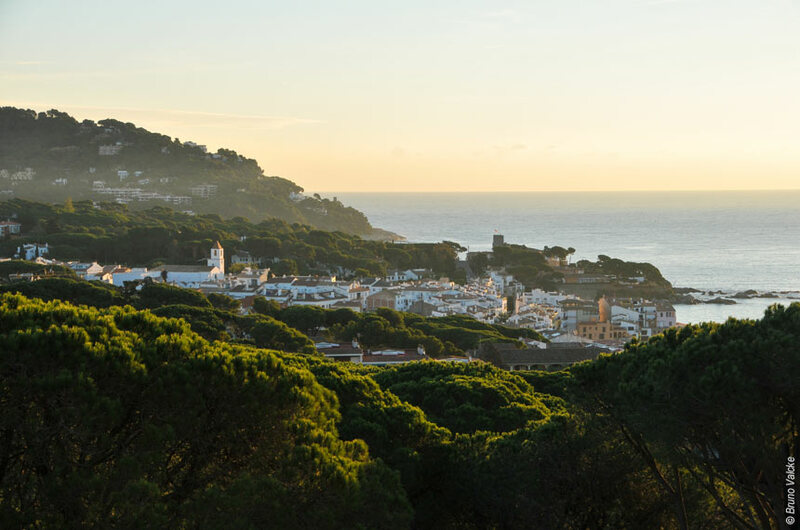 From there to L'Escala, there are almost endless panoramic views. L'Escala has avoided tourism excess, is located in one of the most beautiful bays in the world according to UNESCO no less, and has a variety of Romanesque churches and ancient houses worth visiting, but you can't leave without trying the one thing it is really famous for: anchovies! Your final stage is over the Montgri Massif (not at all massive actually) to Toroella, renowned for retaining its medieval centre from when it was a Royal Port for the Kings of Aragon (until the river silted up). The exceptionally stylish and contemporary 4 star Hôtel Moli del Mig, located in 7 acres of its own grounds, most definitely is. Carefully developed around a medieval mill, it offers style, tranquillity and a range of facilities (large pool, spa, tennis courts etc) as well as a superb restaurant. A real treat! Next is the marvellously, but sensitively, restored medieval village of Pals with many architectural features, a 4 towered castle and a Gothic revival church as well as pretty alleys and squares. If you really like such places, then also visit Peratallada, just a few kilometres further. Now, however, you turn back toward the coast and follow its many creeks and coves as it twists and turns, finally inland, to reach Begur. The 3 star third generation family run Hôtel Rosa is right in the centre of the historic village of Begur with views from its roof top terrace of the village, the castle and the Mediterranean. It has been fully modernised, now offering comfortable bedrooms, and a spa and health centre as well as a restaurant dedicated to the principles of Slow Food. This is a fairly short, but nonetheless lovely, largely coastal journey that, thankfully, begins with a gentle descent to the gorgeous coast at Fornells - reputedly it was this immediate area that inspired the name for the whole coast of Costa Brava. 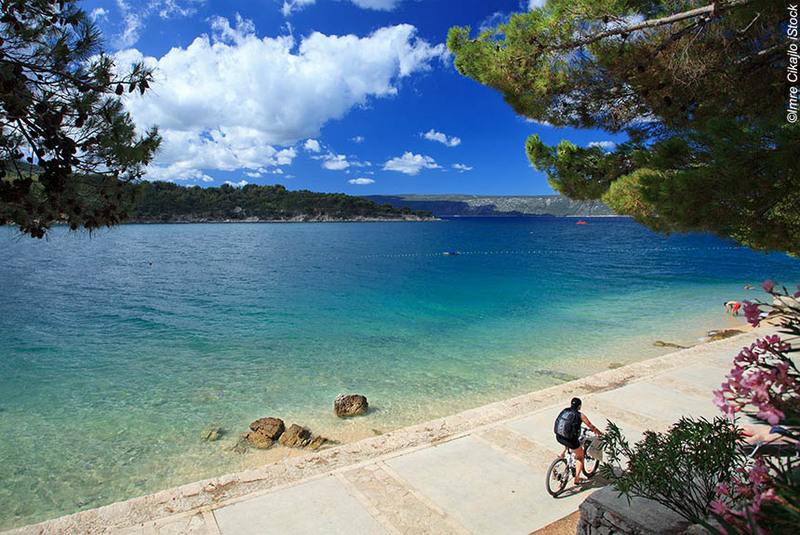 Lots of small coves with sandy beaches backed by pine trees, and so many opportunities for sunbathing and swimming. Decide which is your favourite along the route to Tamariu. From this - yet another largely unspoilt fishing-and-holiday village - you follow lanes up to the Sant Sebastia lighthouse where you are about 600 feet above sea level - enough for wonderful views, but not too tiring getting there. 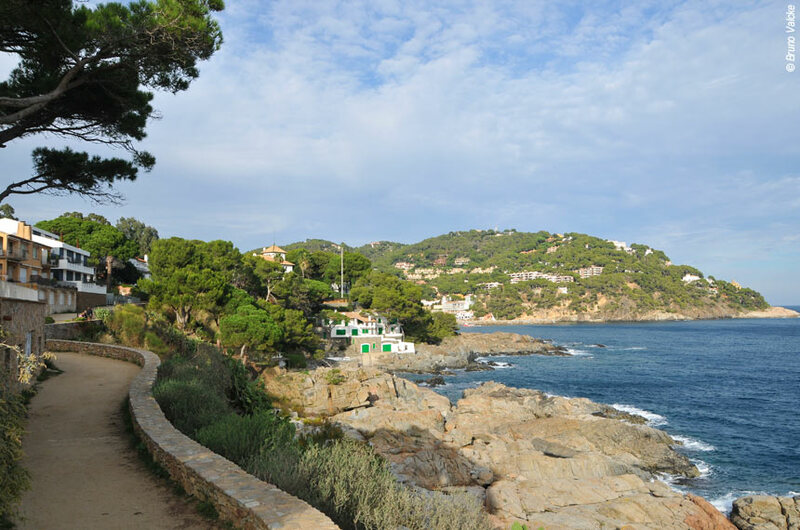 Finally, you pass through Llafranc (attractive in a quiet way, and with a great beach), and the small, some tiny, rocky coves and sandy beaches en route to your final, charming destination, Calella de Palafrugell. If you have energy to spare, then do visit the botanical gardens on Cape Roig, just a few kilometres south. The 3 star Hôtel Sant Roc has a privileged position perched on its own rocky, cliff top headland overlooking Calella, and with several cove like beaches immediately below it. The rooms we choose all have sea views, and are as comfortable as you would expect from a 3 star hotel. You can eat on the terrace with stunning night time views to make it a really special - perhaps sad and celebratory - last evening. Standard option: After a scenic buffet breakfast on the terrace, we will take you back to Collioure (you can collect your car if you have left it here). With extra airport pick-up: After a scenic buffet breakfast on the terrace, we will take you back to Perpignan airport or railway station. Transfers also available to Toulouse, Carcassonne, Montpellier, Girona or Barcelona (please consult us for prices). Because of the mild Mediterranean climate, this itinerary can be enjoyed from early March right through to November, although it can only be reliably warm from mid May to early October. We do not recommend the period from early July until mid August because of heat and busyness, and do not offer the holiday during that time. This holiday features comfortable rather than challenging cycling, and is suitable for anybody who enjoys "a good ride". The overall distance is about 200 kms, 125 miles. We would recommend May, June and September as the best months. We will transfer your luggage between each hotel, so all you need to carry is whatever you regard as essentials. We will transfer your main luggage between each hotel, so all you need to carry during your ride is what you regard as being essentials. You stay in double or twin rooms for 2 nights in four star hotels, 3 nights in three star hotels, and 2 nights in particularly good two star hotels. There is the option of a replacing the first night three star hotel with a four star hotel with a one Michelin star restaurant for a supplement. You will eat well. Dinners are based on set menus featuring regional specialities usually with 3 or 4 choices for each of three courses, but you can pay locally for upgraded choices. Dinner is not included on night 4. Breakfast is included every morning, but picnics are not included as there is a wealth of delis, cafes and restaurants. However, you can always ask the hotel the night before to make a picnic, which you can pay for locally. When we have received your balance of payment for your holiday, and in the month before departure, we send you all the documentation you need: detailed itinerary showing dates, times, contact details etc; a detailed guide to your route (with options) and lots of cultural, historical and nature background information; formal documents (invoices, contracts etc); luggage labels etc. If you book at the last minute, we can send this information to your first night hotel. 6 nights dinner, bed and breakfast, plus one night bed and breakfast; people transfers; luggage transfers; detailed route instructions; 1:25,000 IGN map; 24/7 customer phone service. The price includes the hire of electric bikes. The journey to the start point, and from the finish point, except as specified; lunches; drinks with meals; non-standard menu items; entry fees; personal and travel insurance. If you want to hire a GPS device, please tell us at the time of booking.